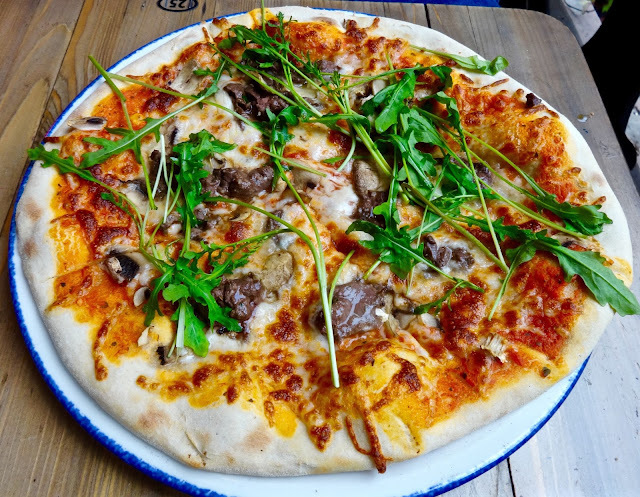 Places I've Eaten: FOOD ROAD TRIP: CAFE CATHEDRAL OSLO NORWAY...REINDEER PIZZA!! FOOD ROAD TRIP: CAFE CATHEDRAL OSLO NORWAY...REINDEER PIZZA!! It's been a long day of walking and boating around Oslo and now we are hungry. Finding a place to eat is not always so easy when you are tired and menus aren't grabbing your attention. This was the unfortunate thing on this particular evening as we went through at least 5 options before finally settling on Cafe Cathedral for two reason--we were tired of walking around and Norwegian pizza. It grabbed our attention enough to say "let's do it". Perusing the menu, it's pretty basic and geared toward the tourist traffic that flows by on it's way to Central Station. This isn't really traditional Norwegian food by any means, but there are notes here and there. We decided to go real basic to start and got a mixed grill thing. Norwegian style pizza--reindeer, mushrooms and arugula thin crust pizza. Yep, that's right, we had Rudolph on a pizza people and to be honest, it won't have bad. The meat itself was tender, like it had been pounded down like they do with schnitzel. It had a mild taste of beef and just a tad bit of gaminess, enough to know you are eating something that isn't cow. I have to say it paired well with the cheese and tomato sauce and didn't seem at all like a weird combination. The only real let down was the crust. While thin, it was a bit under cooked and slightly doughy. It needed about 2-3 more minutes in the oven to crisp up, had they done this it would have been really good. Toppings good--crust, eh. As far as restaurants go it was okay. 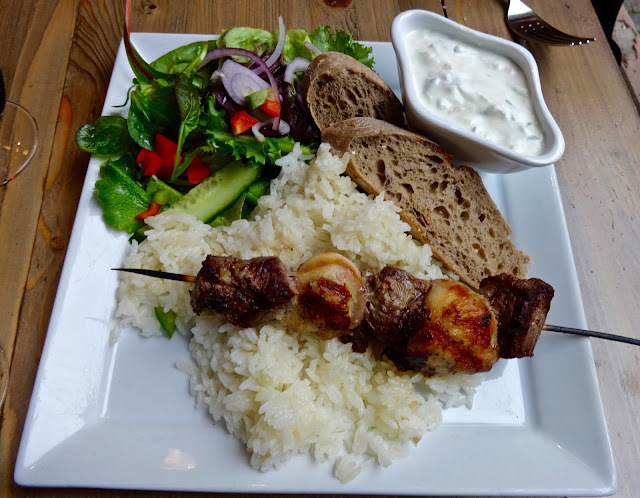 For a spot that probably caters to out of towners more, the food won't bad and prices weren't to terrible for Oslo. The pizza ran about $20 and most dishes are about the cost of what you would find in San Francisco. In my terms, we didn't hate it and were happy enough with the choices we made. Interestingly enough, we asked our server where she goes to eat when going out and she said most of folks really like--wait for it--TGI Friday's. That's right, they like American food (it's what she called it), burgers and things. Very funny, we try to avoid places like that, even in the US (and no, we won't be hitting up the Oslo version). 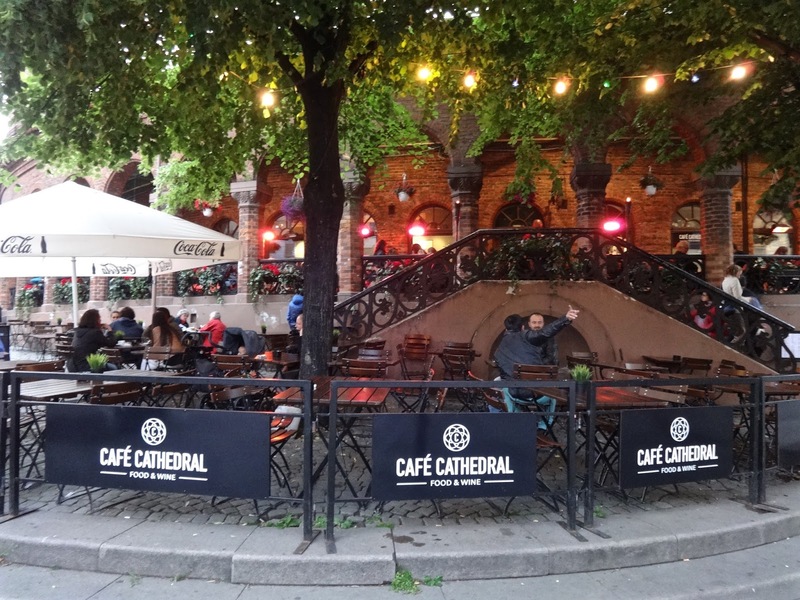 If nothing else at Cafe Cathedral, we got to try Reindeer pizza and for that alone it was worth dropping by.